Sophie Scholl was a member of the Wei�e Rose (the White Rose), a student resistance group that advocated passive resistance to the Nazi regime. Sophie, her brother Hans and numerous other members were found out by the Nazis in 1943 and, within six days, arrested, subjected to a show trial and executed. Generations of student activists have taken inspiration from Sophie&#146;s principled idealism and martyrdom at the hands of Nazi savagery. Marc Rothemund&#146;s film portrays the deeply committed young woman wrestling with the Nazi beast, coming to fully realize that while she might not survive, her ideals would, inevitably, come to prevail. 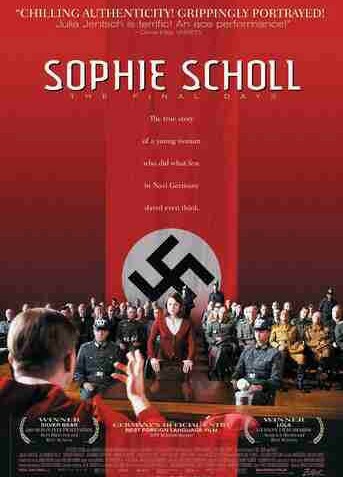 Sophie Scholl and the White Rose have become popular subject matter for serious film treatment. Best known is Michael Verhoeven&#146;s film Die wei�e Rose (The White Rose), which explores the founding and development of the movement as a whole and ends with Sophie&#146;s arrest. Percy Adlon&#146;s F�nf letzte Tage (Last Five Days) focuses on Sophie&#146;s last days, based on the memoirs of Else Gebel, Sophie&#146;s cell-mate, a middle-aged clerk in a Gestapo office imprisoned after being found carrying anti-Nazi pamphlets. Rothemund&#146;s film is based on Gestapo records which became available only in recent years, long after the earlier films&#146; release. The Final Days concentrates on the emotional turbulence of Sophie’s last five days, taking care to convey her spiritual growth. Sophie&#146;s democratic, pro-federalist, German populist resistance to Nazi authoritarianism, Rothemund suggests, was akin to Martin Luther&#146;s spirit of protest as a German populist resisting Vatican authoritarianism. Sophie, a Protestant from the Swabian-speaking region of Ulm, was active in very Catholic, Bavarian-speaking Munich. On February 18, 1943 Sophie Scholl and her brother Hans were caught distributing anti-Nazi leaflets at the university in Munich and denounced by the building janitor to the Gestapo. They were arrested immediately and taken into interrogation. Julia Jentsch&#146;s portrayal of Sophie captures an innocent and untested (though hardly naive), kind-hearted, matter-of-fact girl from the provinces who realizes quickly that her idealism and faith in humankind is rapidly leading to her death. Close-ups of Jentsch&#146;s pale-skinned face, framed by long, straight black bangs, recall Angela Winkler&#146;s Katharina Blum, another idealistic young woman who faced down the authorities, in The Lost Honor of Katharina Blum, Volker Schlondorff and Margaretha von Trotta&#146;s 1975 excoriation of corporate capitalism at the height of Baader-Meinhoff-inspired domestic terrorism in Germany. Rothemund&#146;s drama is gripping, the acting carefully and convincingly nuanced, and the plot masterfully paced. He presents Sophie&#146;s story in three acts. After exploring Sophie&#146;s character and her relationship with her brother Hans (Fabina Hinrics), their political commitment and their life as university students, the plot moves on to Sophie&#146;s relationship with Else Gebel (Johanna Gastdorf) and what becomes more of a battle of wits with interrogator Robert Mohr (Alexander Held). The film climaxes with the show trial. Rothemund exercises considerable restraint, prudently saving the excessive stereotypical Nazi-out-of-control temper tantrums for this final courtroom showdown between members of the White Rose and the Nazi "justice" machine.